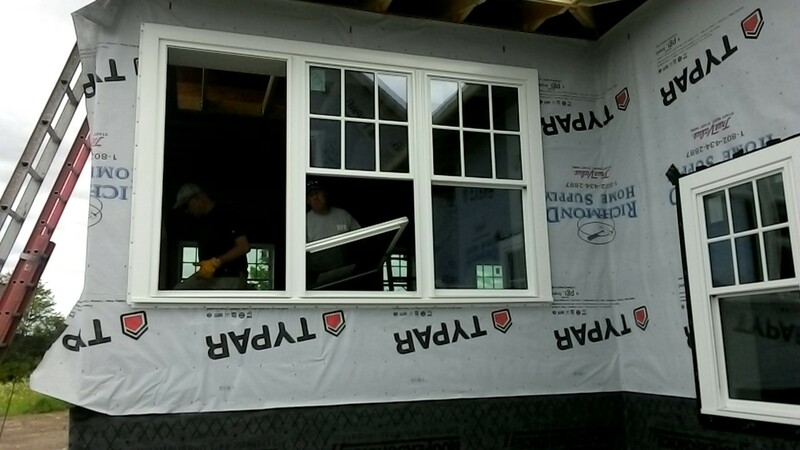 Close up of a window, fully installed. 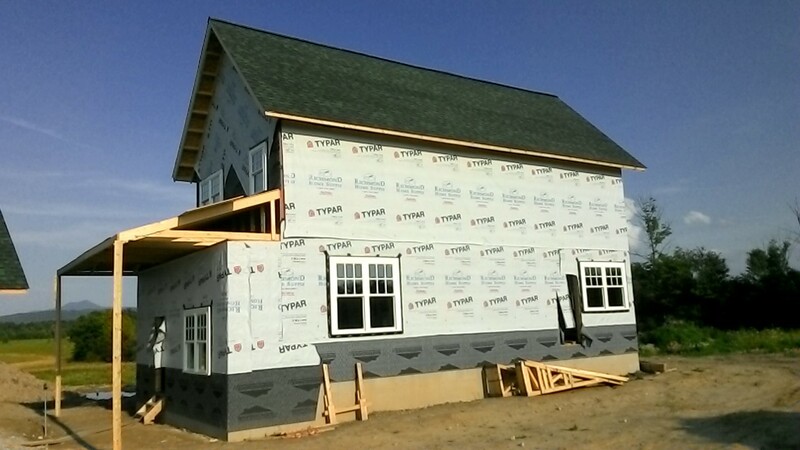 Over the last few days we’ve installed windows galore. 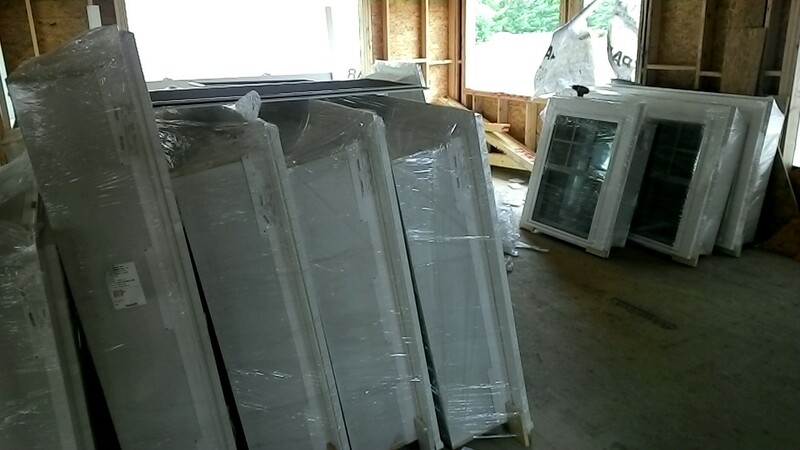 As with many components of construction, there’s a definite sequence of steps we must take to secure each window correctly, including a few optional steps we’ve added to make life easier or improve the efficiency of the complete house. Step 1: Unwrap a window. (You can determine if it’s the right one by a code on the packaging.) Measure the rough opening dimensions and check that the window is about 1 inch smaller both ways. 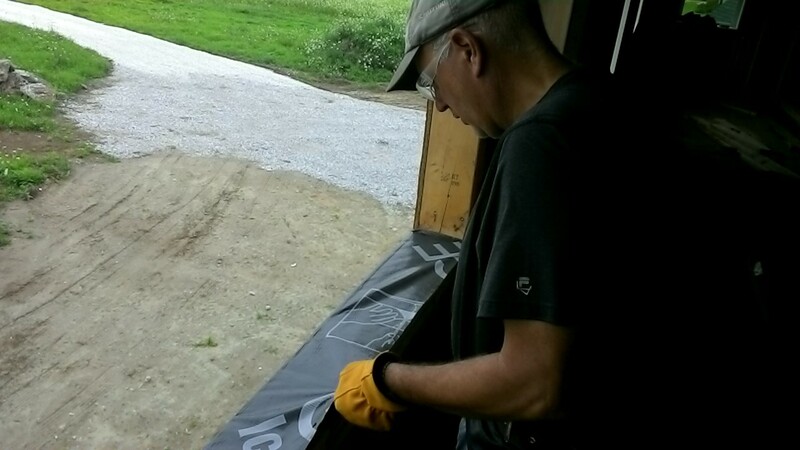 We learned from building the Barn not to frame our rough openings too small, because the windows can jam on their splice plates during installation. If there’s a mistake, plane down the studs or sill plates to enlarge the opening before any further preparation occurs. The future living room last week, all filled with wrapped-up windows. Step 2: Remove screens and sashes to lighten the window frame (it’s unwieldy with the glass but quite light without), and take off the lumber skid. Step 3: Prepare the window opening. If there’s a roof just below the window, install flashing to protect the sill from splatter. 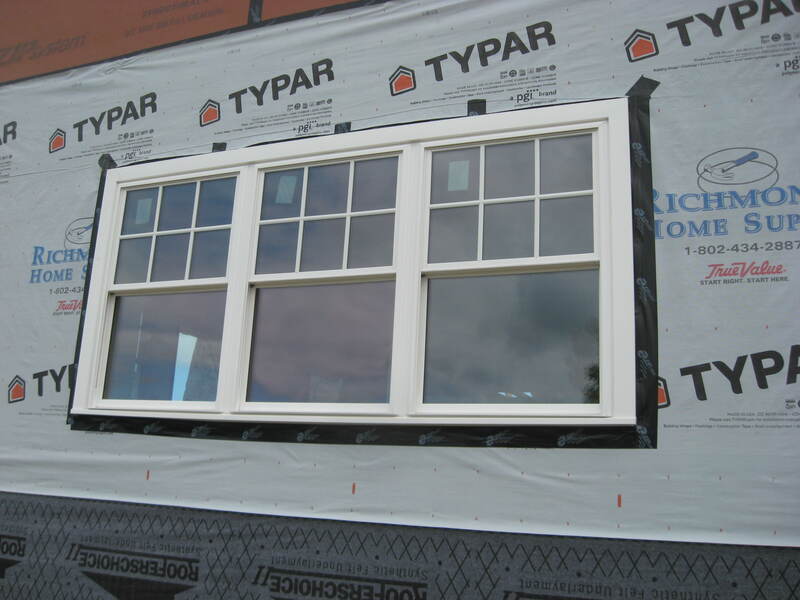 For all windows, install half-inch plywood spacers on the sill, taking care not to interfere with any mullion locations. (The mullions are built with metal splice plates that hang below the rest of the frame, and spacers ensure they don’t get in the way.) Cut back the Typar house-wrap one inch around the rough opening perimeter, then put a bead of silicone caulk around the perimeter. 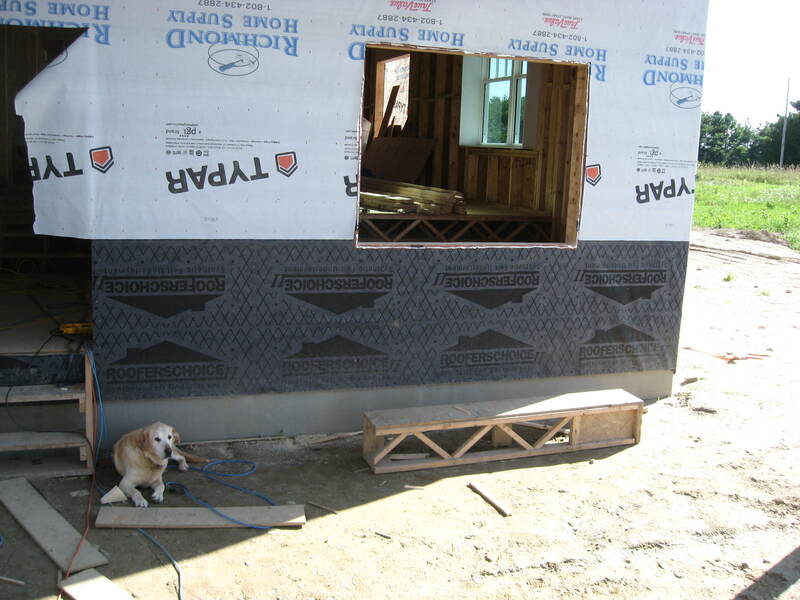 Neo protects a fully prepped rough opening, with Typar cut back and a bead of silicone caulk. 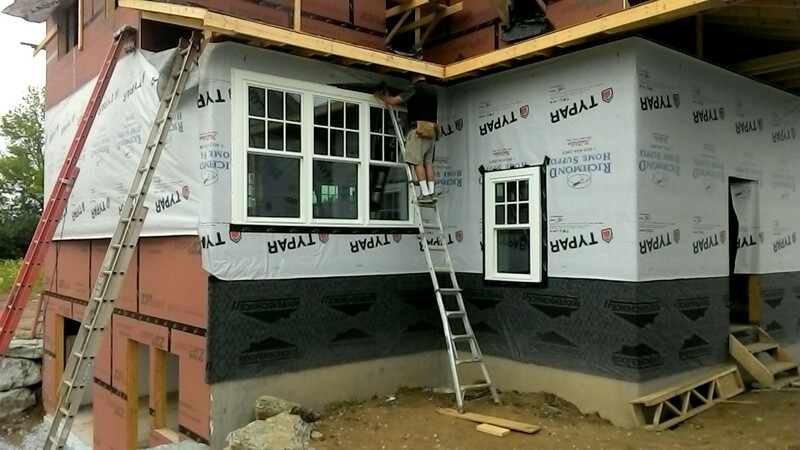 Step 4: Prepare access outside by setting up a ladder (or two, for a large window) just below the rough opening. Step 5: Maneuver the window into place. We used two main methods: pass the frame out the opening, or hoist the frame up the ladder. Both methods required some fancy handling by the person on the ladder, and careful alignment by the person standing inside, while both supported the frame’s weight. 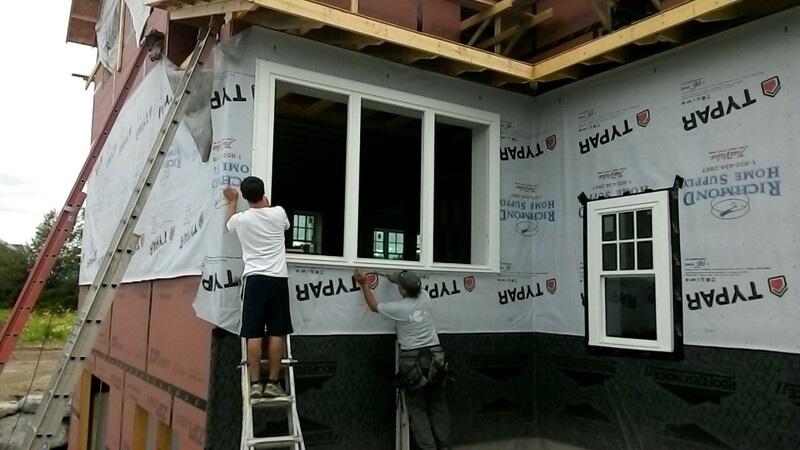 Carson and Terry nail a window in place. Step 6: Check that the window is level and centered in the opening, then tack-nail the bottom edge of the trim. Check the diagonals for squareness, then tack-nail the top. Do a final check that the window’s location is perfect, then finish nailing around the perimeter. Re-installing the glass. Sashes pop in easily if they were taken out right. Step 7: Put the sashes back in, and complete the 2×4 framing for the inner portion of the double-wall (which was left out so the frame would slide in easily). Step 8: Air-seal around the frame. On the outside, Zip-Tape between the wall and the window trim. On the inside, fill around the jamb extensions with expanding foam. Colin unrolls Zip Tape around the perimeter. We got into a nice groove (as usual) and installed windows rapidly, learning how to complete several steps in a row to minimize ladder movements. What a relief to have all the windows in. All that remains is to carry through Steps 7 and 8 for every window. We had a bit of a challenge finding a foam that will expand to fill the gaps around the rough opening without putting pressure on the jamb extensions… but we’re never ones to back down from a challenge. Recent view of the front façade. Since taking this picture we installed this wall’s three second-floor windows, too.